Stay visible on night walks and look great during the day with the Primary Clip Dog Collar in Purple! Reflective stitching strip and RC signature label is visible up to 25 meters. Hardware is Nickel plated to resist wear. Machine wash cold on delicate cycle. Dry flat. Place in a wash bag to prevent hardware from damaging machine. Do not bleach, do not iron, do not dry clean. If needed, pre-soak in an enzymatic cleaner like Nature's Miracle. Matching Leash and couplers sold separately. More of a grape color than the red violet shown, so doesn't quite match leash. Posted On 02/16/17 by Michele M A from , WI Yes, Michele M A recommends this product! This collar is very well designed. Pretty in purple. The quality is excellent. Sizing is true to chart. Ording is a breeze and the shipping could be better and fast. I have been ordering from Baxter Boo often and they never disappoint. Posted On 11/29/16 by nancye t from natick, MA Yes, nancye t recommends this product! Love this new collar. 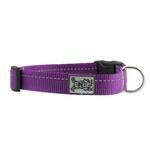 The collar is a rich purple with a small reflective stripe around it. The sizing guide was a big help in determining which collar to buy. As always, Baxter Boo offers the best products!! Posted On 11/09/16 by RIta I from Chalfont , PA Yes, RIta I recommends this product! Website could be easier to navigate back and forth.